We’re getting that question a lot today, so we’ve decided to post some resources that explain what happens during a government shutdown. One thing you need to keep in mind is that the federal government has shut down many times since the 1970’s and America is still here. 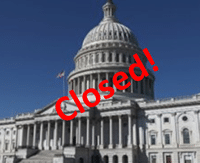 Q&A: What Happens During a Government Shutdown? Some of the claims being made about what happens to the federal government when there is a funding lapse are almost hysterical – One U.S. senator even claimed that a shutdown would be “as dangerous as the break-up of the Union before the Civil War.” Here are answers to some basic questions about a shutdown. Q: Is such a funding lapse unusual? A: No, such a lapse in funding would be neither unusual nor catastrophic. There have been 17 funding gaps just since 1977 ranging in duration from one to 21 days. Under applicable federal law, operations and services would continue for those essential for “the safety of human life or the protection of property,” as well as those programs funded through multiyear or permanent appropriations. The truth from the experience of prior shutdowns, applicable federal laws, Justice Department legal opinions, and Office of Management and Budget (OMB) directives, is that crucial government services and benefits would continue without interruption even if Congress fails to agree on a continuing resolution (CR) or President Obama vetoes it. That includes all services essential for national security and public safety — such as the military and law enforcement — as well as mandatory government payments such as Social Security and veterans’ benefits.